Ouyang Xue died on 5th November 2012. "Xue" means "Snow" in Chinese language. Her name resulted from a heavy snowstorm that occured, when she was born in Nanjing, 250km west of Shanghai. ... Xue's Mexican friends liked to call her "Nieves". "Look, somebody takes a photo of us!" 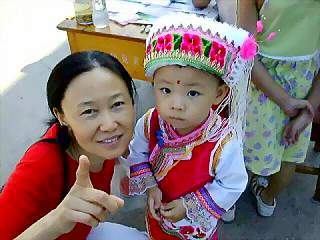 Xue liked children very much. After the marriage she had immediately taken over her part of the care for Gerhard's foster-children who had earlier been living under very poor conditions in Sri Lanka, Indonesia, and the Philippines. Now they got regularly food, medical treatment, and education. Since 2009, the sponsorships have expired. 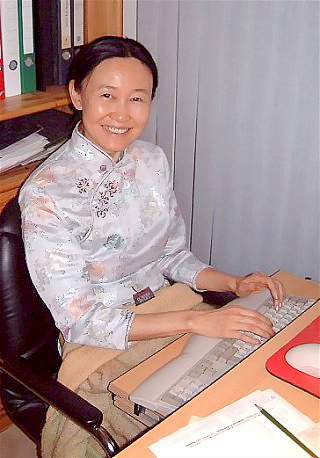 Although Xue sometimes wore traditional dresses because she was proud of her Chinese origin and China's rich culture, she also knew pretty well how to handle modern equipment like a personal computer - and still remained 'a Lady'. She was keeping contact with her numerous friends from all over the world via PC, phone, and letters. In August 2007 Xue started as a freelancer to teach Chinese language and give intercultural training in German companies for those employees and executives who may travel to China for business purposes. She was respected as a serious and nevertheless humorous teacher - and the students enjoyed the lessons with her very much. 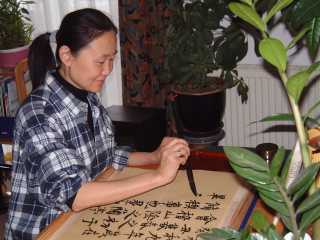 Below: Xue also liked to practice Chinese calligraphy at home (see Xue Calligraphy).